The African Flameback Angelfish, also known as the African Pygmy Angelfish or Orangeback Angelfish, has striking contrasts of blue and orange-yellow colors. While the body is predominately blue, there is a broad, bright orange to yellow swatch from the head along the back to the tip of the dorsal fin. The caudal fin is yellow and somewhat transparent, which helps to distinguish it from the Brazilian Flameback Angelfish (also known as the Fireball Angelfish � Centropyge aurantonotus). This feisty little jewel is one of the smallest of the Centropyge family and is known for spawning in the home aquarium. Males and females can be kept together providing they are introduced simultaneously. Be careful that your pair is male and female as introducing two males will result in a battle to the death. The Flameback Angel - African prefers a tank of at least 20 gallons with plenty of places to hide & swim.The dwarf Flameback angelfish will come generally 2 to 4 inches .However the Flameback angels grows up to 3 inches. Keep water quality high (SG 1.020 - 1.025, pH 8.1 - 8.4, Temp. 72 - 78� F). Origin: The Flameback Angel - African is a medium maintenance fish. 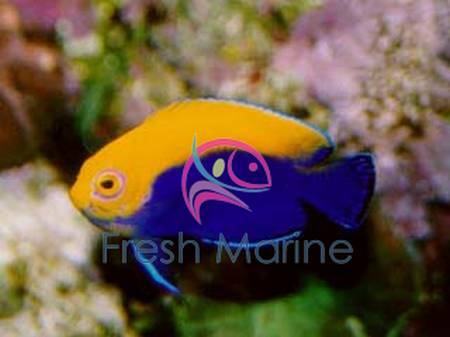 Specific Care Information: Dwarf Flameback Angelfish are generally peaceful fish but will often quarrel with members of their own species and even genus if they look similar enough. Though there are reports generalizing this species are 'reef safe', it is strongly advised to add them to a reef with extreme caution. The reason for this is that many of Flameback species will behave like model citizens for a while, but one day will go after corals and clams for no reason. This may have something to do with the Dwarf Flameback Angelfish being predominately plankton eaters as juveniles. An underfed adult may attempt to try something new and find that clams and corals are it's newest favorite diet. It is recommend purchasing the youngest specimen available in hopes it settles down and learns to eat a captive diet prior to learning that corals and clams are a tasty treat. It is important to provide Dwarf Flameback Angelfish with plenty of good quality cured live rock and a well aquascaped aquarium with caves, archways and overhangs to swim through or hide in. Especially if there will be more than one Dwarf Flameback Angelfish in the same aquarium. Members of the Centropyge genus are referred to as Dwarf Angelfish because of their smaller size in relation to their larger Chaetodontoplus, Genicanthus, Holacanthus and Pomacanthus cousins. Diet: Will readily accept most frozen and prepared foods. It is best to feed frozen mysis shrimp and spirulina algae if the African Flameback Angelfish is not kept in a well established aquarium. Breeding and Propagation: Flame Angelfish are protogynous synchronous hermaphrodites meaning the all start off as unsexed and develop into fully functioning females and later have the potential to change into a male should no other males be available. There are no visible differences between males and females. In the wild they form small harems between three to seven individuals when it's time to spawn. They haven't successfully been bred in an aquarium.